The Chapel of the Chimes at First Congregational Church of Buena Park was constructed in 1928. Spanish Revival in theme, complete with bell tower, it is the oldest church in Buena Park and is listed as an historical site in Orange County. 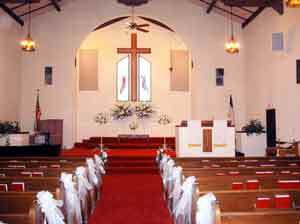 The sanctuary can accommodate up to 220 guests, including the overflow balcony offering a birds-eye view of the ceremony. It is open beam construction with hand-painted ceiling tiles, padded wooden pews (some dating to the original 1888 structure), and beautiful stained glass windows. The colorful windows can be used as background for some exceptionally lovely photographs. The formal rose garden connecting the church to two of Buena Park’s vintage homes is available for photographs following your ceremony. Please contact us at (714) 522-1832 or fill out the form below.